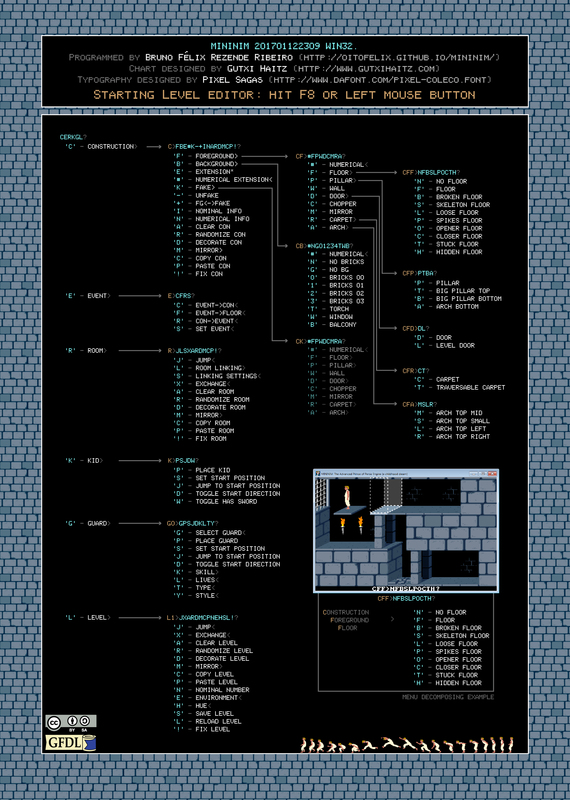 MININIM is the Advanced Prince of Persia Engine — a childhood dream, the free software implementation of Jordan Mechner’s masterpiece game, developed from scratch by Bruno Félix Rezende Ribeiro (oitofelix). MININIM is free software; you can redistribute it and/or modify it under the terms of the GNU General Public License as published by the Free Software Foundation; either version 3, or (at your option) any later version. In addition to being already a complete replacement for the original game with several improvements, MININIM aims to have detailed documentation on all matters concerning the original Prince of Persia world, ranging from its design concepts to the engine’s practical use and development. MININIM documentation is free; you can redistribute it and/or modify it under the terms of the GNU FDL (Free Documentation Licence) as published by the FSF — with no Invariant Sections; either version 1.3, or (at your option) any later version. Replay recording, playing and chain validation. The following additional features are planned to be implemented soon. The following videos demonstrate features that are already implemented and will come up in the next release. If you like MININIM and want to show your appreciation or enable oitofelix to spend more time on its development (so these features come out faster and better), PLEASE, CONSIDER SUPPORTING MININIM DEVELOPMENT! PODebug has a podcast episode from august 2016 titled Recriando Prince of Persia: Dois Projetos Brasileiros (Recreating Prince of Persia: Two Brazilian Projects) for which Bruno Félix (oitofelix) was invited to talk about MININIM. Here’s a MP3 for download (Portuguese). 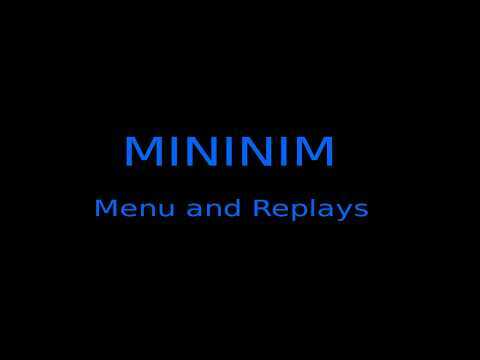 A Youtube playlist of a full walkthrough of the standard Prince of Persia legacy level set, using MININIM’s replay capabilities is also available at oitofelix’s channel. MININIM is under constant and fast development. It uses a rolling release scheme, meaning that updated versions are often released as soon as new features have been implemented or bugs have been fixed. This way the latest developments are always available to an wider audience. Notice that its version number reflects the date of release. Its user’s manual (in PDF format) is bundled in the hope that it might be useful, but keep in mind that it lags far behind the current development stage of MININIM and thus doesn’t describe several features thereof accurately or at all. The author plans to update MININIM’s documentation in a definitive manner when MININIM reaches reasonable feature-set stability. In case you’d like to help in speeding up this process by maintaining its documentation, you’re very welcome! Please, contact the MININIM community at its forum. If you are under Microsoft Windows a MinGW build is readily available. No installation is required, just extract the zip archive and run ‘mininim.exe’. If you use GNU/Linux, you have to clone its VCS repository and build it yourself. It should be quite straightforward — just follow the advice given at its GitHub page. If you are planning to build Allegro from source consider using oitofelix’s fork for best results. It may have improvements brought to the library through MININIM. 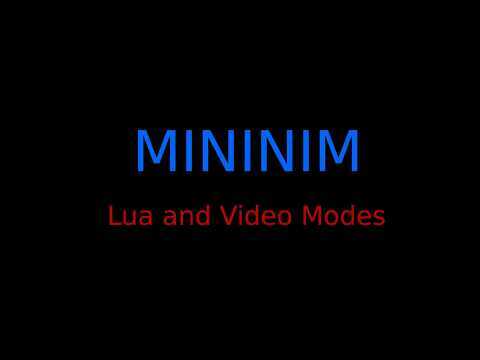 This briefly describes how to access most currently implemented MININIM features. You can have access to other features using the command-line. Use mininim --help for a complete list of the available options. In case you have any question about MININIM, the best place to obtain help is at its forum. 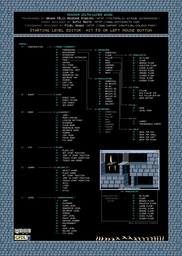 The following schematic chart documents MININIM’s level editor functionality. Thanks to Gutxi Haitz Céspedes who designed and released it freely under the CC BY-SA 4.0 and GNU FDL v1.3+ licenses. MININIM development is voluntary. If you like this game and want to thank the author for the work he has done so far, or want to enable him to spend more time improving it, please make a donation! For values equal or greater than 50 US$ or 0.12 BTC your name will be acknowledged in the “Donors” section of the manual and in the donors page. If you decide to make recurrent donations, the total amount of your donations will be updated every month for all records. Thank you for your support. 1 Jordan Mechner (born June 4, 1964) is an American video game designer, author, screenwriter, and filmmaker, best known for creating the Prince of Persia video game franchise and the 8-bit computer game Karateka. 2 Of course, none of this is reason enough to name a game engine “MININIM”, if not by the fact that it’s a really cool palindrome! This work is licensed under a CC BY-SA 4.0 license. You are free to copy and redistribute the material in any medium or format, for any purpose, provided you abide to the license terms. If you find any broken link, typo, grammatical or factual error, have any criticisms or suggestions, please don't hesitate to contact me at oitofelix@riseup.net.